Can’t sleep, so might as well blog, right? This book opens with Johnny, the protagonist, being woken in the middle of the night, and going to investigate the unusual disturbance. 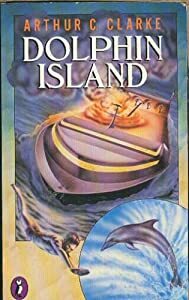 Which wasn’t necessarily so clever, but does work out well enough for him, since through several unexpected events he ends up living on Dolphin Island, a dolphin research station on the Great Barrier Reef off the coast of Australia (he started well inland in the USA), and making a new and much happier life for himself there. This is one from my DH’s extensive collection of mid-20th century science fiction, and is apparently one of Clarke’s few specifically YA novels. It’s about the the new (then) field of research into dolphin communication, and assumes this field would get far further than I’ve ever heard about it doing so far. It’s not bad, but not as good as I might have hoped, either. For a novel from the 1960s, set over half a century into the future, it’s also too noticeable that we only meet one human female character at all (although she is a figure of respect and status within the community, as the island’s nurse and medical expert, and a very nice person) and the only others referred to (Johnny’s aunt, Professor Kazan’s wife) are portrayed rather negatively. The cetacean females get a far better deal! Of course, I’m perhaps unfairly somewhat put off by the fact that Clarke doesn’t appear to have considered what might have happened in the oceans by the time of his future setting, so there is absolutely no issue of pollution or over-fishing to deal with, nor any recognition of other problems cetaceans might potentially have with human behaviour (such as noise pollution). I’m certainly not put off Clarke’s writing style, but will have to find some of his books better than this one to become a real fan.